The final two reveals! Electron+ will be cast in a clear blue, while Alpha 7 is a little green man. Previously, he was a little blue-green man, so it's not a tremendous difference. But it's different. Details on how these will be sold are said to be approaching next week. Obviously, it's in New York, but things like prices and booth numbers are to follow. The reveal continues! 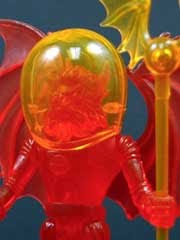 Today's New York Comic Con exclusive is Mystron, the Man from Hollow Earth in an appropriately devilish red color. Details as to which specific booth will sell it are unknown, but for now go here and check out the photos! 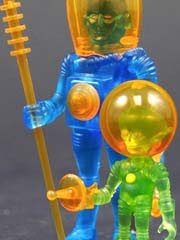 Yes Virginia, there will be New York Comic Con exclusive Outer Space Men this year! 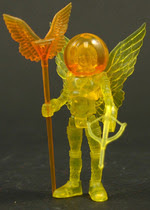 The first is Commander Comet in yellow, with orange plastic gear. Only 300 will be made, and figures will be sold via the Action Figure Xpress and Toy Tokyo booths in New York. More details will follow but for now, check out more on the Four Horsemen site! Over on The Four Horsemen's Fantastic Exclusive Forums you can find the very first pictures of the presumably final sculpt of Orbitron, the Man from Uranus. It's a slightly different sculpt than the one shown at Comic-Con in San Diego last July, better and funkier. The hands are open claws, as opposed to the closed fists most of the figures have. There's also a waist joint, and the posting makes confirmation of a 14th "Space Man," which could well be Pheyden from the Glyos line or something completely new-- or one of those swell head variants they've been teasing over the past few months! I'm looking forward to it.